CAT CORNER > Behavior & Health > Should Your Cat Be Indoors or Outdoors? What's right for your feline? Many cat owners wonder if they should let their cat outside to roam free and explore. There are some concerns that cats may be bored indoors or aren’t getting enough sun exposure, or maybe they aren’t making any friends. But, there are also the dangers of letting your cat outdoors, such as animal attacks or unwanted pests crawling into your feline’s fur. In fact, most vets and the ASPCA strongly recommend keeping your cat indoors. Here are some good reasons why — and some ways to keep Kitty entertained in her palace. Outdoor risks and common fears. Cars: Although cats have great instincts and do their best to avoid cars, cars can sometimes come out of nowhere, and can be potentially fatal if your cat comes into contact with a vehicle. People: Not everyone reveres cats as much as we do. Keep Kitty indoors — and safe from being a target of mean people. Animal attacks and attacking animals: Cats, even well-fed ones, are prone to enjoy hunting birds and small animals. While it may seem harmless, loose cats kill millions of birds each year. Plus, cats may contract diseases from the birds or rats that they hunt. Conversely, although felines are generally great hunters with great instincts, they’re also susceptible to being hunted. Cats are commonly attacked by dogs and wild animals, such as coyotes, foxes and other local predators (depending on your neighborhood). Little kitties can sustain serious injuries — or worse. Diseases and poisons: Heads up: The American Feral Cat Coalition estimates that there are approximately 60 million feral and homeless stray cats living in the U.S., and that many of these cats carry diseases that could be passed onto your cat if they come into contact with each other. Another risk to keep in mind is that outdoor cats may be prone to accidentally drinking poisonous fluids, such as gasoline, antifreeze or rat poison. Parasites: There are also several, non-life-threatening parasites that your cat may pick up while exploring the outdoors, including — ugh — fleas, ticks, ear mites, ringworms and more. These awful bugs can be hard to get rid of, and may even creep into your home if they jump onto the sofa or carpet. Ways to keep your outdoor cat safe. Keep your cat on a leash: Cats can learn to walk on a leash and eventually (maybe) like it. And yup, you’ll be “that” gal in the neighborhood. Build a catio: Create an enclosed space where your cat can be outdoors, but not exposed to other cats or potential risks. There are tons of great ideas on Pinterest for catios. Make sure Kitty is up-to-date on shots: Make annual veterinarian visits to make sure your cat has the latest vaccinations and is checked regularly for parasites or other potential hazards. Ways to engage your indoor cat. If you’ve decided to keep your cat indoors, but want them to reap some of the benefits of being an outdoors cat, here are some ideas to engage your kitty. You’ll notice that many shelters will list that a kitten may only be adopted with their brother, sister or companion. That’s because many cats — but not all — enjoy having a buddy. Playing, chasing and snuggling are all crucial to your cat’s need for exercise and love. 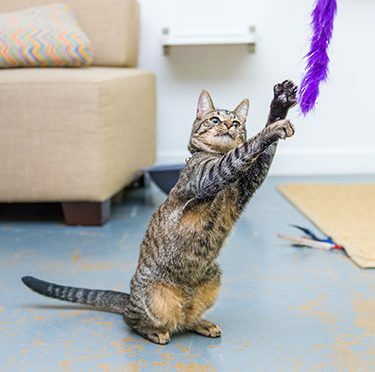 Though you may be giving them tons of human love, it could be beneficial for your cat to play with other animals, too. This is much easier to do when your cat is still a kitten. Dig into our recommendations on how to introduce cats to other cats and to dogs. Allowing your cat to play with a variety of toys keeps them physically and mentally stimulated. Like children, cats will get excited anytime they receive a new toy. Instead of constantly buying new toys, consider doing a toy rotation where you put some toys out for a few days while concealing other toys for those few days. When your cat eventually tires of her toys, you can swap the ones you concealed for the ones strewn around the house, so the toys feel brand new once more. See our recommendation for great toys for cats and how to DIY exciting toys. In addition to playing, cats also have the natural instinct to scratch surfaces and sharpen their claws. Scratching posts are a great way for cats to have an appropriate place for them to stretch their claws. Consider having several types of cat scratchers strewn throughout your house, so your cat has options (ones that don’t include your furniture). Instead of letting your cat outdoors to find their playground, try creating one indoors. You can arrange your shelves or cabinets for your cat to play on, or you can hop over to your local pet supplier to buy a cat tree. There are even DIY sites that walk you step by step through how to make your own cat tree at home. If you don’t have enough space in your home for a cat tree, you can also create a hiding space for them with little to no money since cats love hiding in anything and everything that you bring home. Whether it’s a paper grocery bag or a shoe box from your latest splurge, let your kitty play around with cheap materials. You’ll be amazed at what will hold her attention and what he’ll find amusing by using only his imagination. Does your cat need a new hiding place? Join the Paw Points® Reward Program, and earn enough points to score rewards like a FREE leopard kitty camper lined with soft microfleece for a cozy hideaway. Check out the Paw Points® catalog to find other rewards that will make your cat purr with joy.